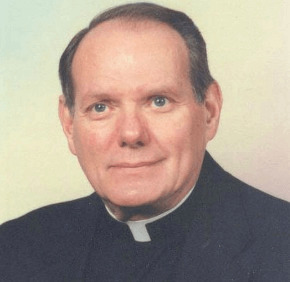 Father J. James Purvey, who served at several parishes in the Archdiocese of Baltimore, was remembered as a priest who could tell a good story and had a special commitment to visiting and anointing the sick. Father Purvey died Feb. 28 at age 81. Archbishop William E. Lori was to offer a funeral Mass March 5 at Stella Maris in Timonium. Father Purvey began his religious ministry in 1953 as a Franciscan Brother of Brooklyn, N.Y. He served as a schoolteacher. In the early 1980s, Father Purvey began studying for the priesthood for the Archdiocese of Baltimore, interning at St. Jerome and St. Thomas More, both in Baltimore. He was ordained Nov. 24, 1984, in Baltimore. “Father Purvey was a man who loved to tell stories, and he loved to tell funny stories from his time as a Franciscan Brother,” remembered Bishop Mitchell T. Rozanski of Springfield, Mass., who was ordained with Father Purvey. After his ordination, Father Purvey served as associate pastor of Sacred Heart of Mary, Graceland Park. In 1991, he became associate pastor of Immaculate Conception, Towson. He moved to St. Michael the Archangel, Overlea, in 1994, as associate pastor. “Sacramental ministry, confessions, funerals – those types of things were his lifeblood,” Father Proffitt added. When St. Michael began a Hispanic ministry, Father Purvey eagerly dove into learning Spanish, Father Proffitt said, and volunteered as a tutor at Catholic Charities’ Hispanic Apostolate, now the Esperanza Center, in Baltimore. Father Proffitt added that Father Purvey, himself in recovery, sponsored a number of people struggling with alcoholism. Father Proffitt noted that Father Purvey maintained the simple lifestyle he had adopted as a Franciscan Brother. Any meal taken outside the rectory “was excellent, no matter how good or bad it was,” Father Proffitt recalled. “When he left the rectory, he didn’t take a whole lot with him,” he added. Visitation will be offered March 4, 3-9 p.m., at Ruck Funeral Home in Towson, and March 5, 8:30-9:45 a.m., at Stella Maris Chapel in Timonium. The March 5 funeral Mass will be offered at 10 a.m. at Stella Maris.